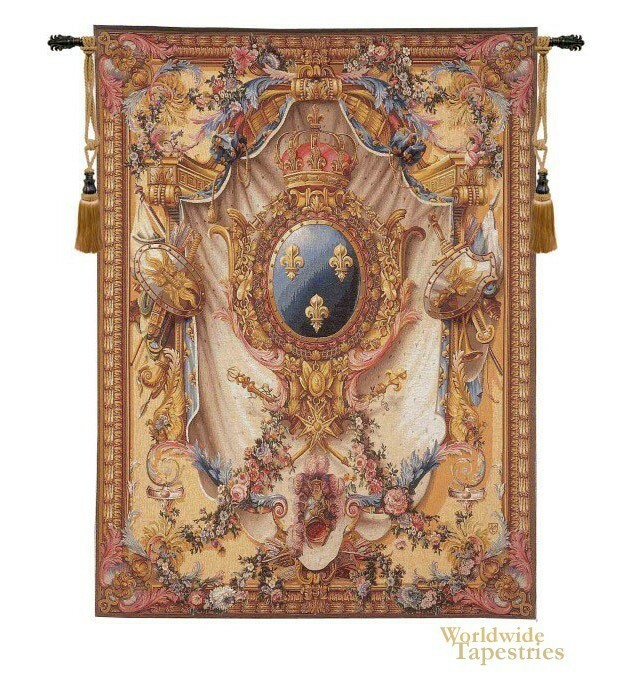 This elaborate royal crest "Grande Armoiries Beige" tapestry shows a design by Pierre Josse Perrot. There were different versions woven at the Gobelins at the beginning of the 18th century. The originals are now at the Louvre and at the Versailles castle in France. They were the grand Gobelins tapestries to announce the reign of Louis XIV as a 5 year old in the year 1715. In the Grande Armoiries designs, composed of over 20 versions, which are a remarkable work, we see the arms of the French Kingdom, which are s three gold fleurs de lys on azur blue base. Perrot created a work of art from the royal crest where we see an ornate fantasy work of the cartouche, shields and armor, swords as well as the royal crown, accompanied by flowers, roses, the fabric of the imperial mantle and feathers. Here the beauty of armor is associated with the beauty of nature and décor, to create a work which is truly remarkable in its composition, showing the royal crest in all its glory. This medieval coat or arms tapestry "Grande Armoiries Beige" is backed with a lining and has a tunnel for easy hanging. Note: tapestry rod, tassels, and accessories, where pictured, are not included in the price. Dimensions: W 59" x H 78"